The surname Miller attached to Christian, in this case, is perhaps the most common one in our Somerset County, Pennsylvania. The demographics of this “Roof Garden,” as its called, has been primarily German and Swiss-German since the European migrations began in the late 18th century, especially after the signing of the Ft. Stanwix Treaty of 1784 allowing white settlers to legally and safely cross the Allegheny Mountains and begin building homes. First arriving in Philadelphia’s Germantown section a century before, they almost immediately began spreading westward toward the Susquehanna River, into neighboring Berks and Lancaster Counties. A religious people, they fell into four primary denominations: Anabaptists (Amish-Mennonite), New Baptists/Brethren (Dunkards), Reformed/Evangelicals (Congregationalists), and Lutherans (high church adherents to Martin Luther). See “German Protestants” and the articles under German Origins. 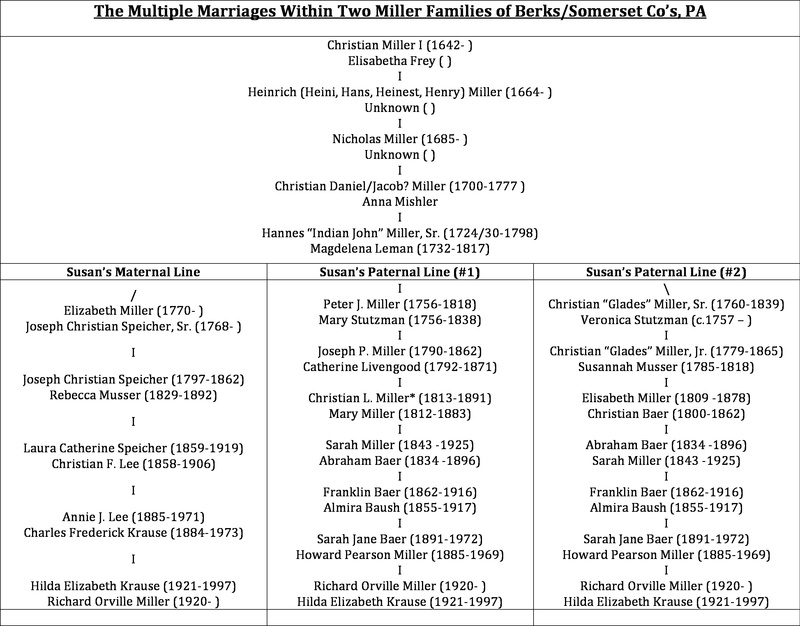 My wife Susan’s maiden name was Miller, and her father’s family can be traced back to the German Lutheran Joseph “Yost” Miller (b.1748), who came from Berks County to northern Somerset County (Quemahoning Twp.) in about 1782. Susan’s mother’s mother was a Swiss-German Amish descendant from the southern part of the county and most of her families likewise began their American experience in Berks County. Historians agree that passenger lists provide confusing clues as to who belonged to what family. Christians, Josephs, etc. abound. See more on the Amish-Mennonite settlements at Hannes “Indian John” Miller. As my research continued, I found the Miller surname the most common in the New World, and the given name Christian is to the point now where more that a dozen can be connected in one way or another within our families. For example, over the stretch of four generations, three different Miller families married into Susan’s paternal grandmother Sarah Jane Baer’s (b.1891) line, each from a different religious tradition, with possibly two from Susan’s maternal grandmother’s line, but probably all from the original Christian I. The purpose of this article is to differentiate Susan’s dad’s (Richard b.1920) Lutheran, Dunkard, and Reformed families, originating with Joseph “Yost” Miller (b.1748) and Christian Baer (b.1800), from her mother’s Anabaptist families, originating with the patriarch who we will refer to as Christian Miller I (b. 1642). See “Our Joseph “Yost” Miller Family Tree” and “Introduction: Baer” for the paternal, and be forewarned that you’ll see several Joseph Millers and Christian Millers. So then, this piece is about the many Christian Millers, at least one nearly every generation for over 300 years. One needs a scorecard to keep the families and subsequent religious persuasions straight. Though some genealogists may disagree with our names, dates, and connections, we offer a unified theory, the first in our family anyway. Furthermore, we’ll use a coding (I, II, Sr. & Jr.) that will allow the reader to understand and remember our Christian Millers of Switzerland, Eastern Pennsylvania, and Somerset County. The hyperlinks are very important here, so feel free to go off to the various family trees, but then click the return arrow and come back for more discussion. Let’s begin with Susan’s maternal Christian Miller connection and then trace her paternal connection, with some aside references along the way. The earliest known Miller from either side was Rosina Mueller (birth and death dates and parents unknown) who married Gilgen Moser (b. 1550) (now spelled Musser) in 1579 in Germany/Switzerland. Rosina was first found on the maternal side of Susan’s family but at this time we can’t connect her family directly with and of the later Millers. That was 370 years before the birth of Susan’s father, Richard Miller (b. 1920). Incidentally, one of Gilgen’s probable descendants, Hans “John” Musser (b.1704), appears 150 years later as the grandfather of Susannah Musser (b.1785), who married a Christian Miller (b.1779). Research is ongoing as to him being the son of Christian “Glade,” Sr., about who we will hear shortly. A later Musser, Rebecca (b.1829), also appears in Susan’s maternal line. But back to the subject at hand. Swiss-born Christian Miller I (b.1642) on Susan’s maternal side, a century after Rosina, produced the famous Hannes “Indian John” Miller (b.1720/30). We refer to old Grandfather Hannes as a family signpost or marker because his story was one of a kind and his nickname is memorable. He’s easy to find as a commonpoint, other than Christian, when the later Millers intermarry, as we will see later. It’s his three children, Elizabeth, Christian “Glades,” Sr., and Peter J. that began the various lines we are considering here. Elizabeth (b.1770) was the grandmother of Laura Catherine Speicher (b.1859), my wife’s great-grandmother who married Christian F. Lee (b.1858). Incidentally, this Christian’s father was Thomas “Tommy” Lee, Jr., another colorful family signpost whose mentor was Bishop Benedict Miller, another distant relative through Hannes “Indian John.” Now, let’s look at the Miller connection from Susan’s paternal side. I see from reading Miller genealogies that the “Christian Miller” confusion became so great over the years, before families began using middle names and initials, that nicknames, place names, occupations, and even ancestors’ names were often inserted. Now, this is in addition to some use of traditional German naming customs, about which you can read at http://www.kerchner.com/germname.htm. We earlier mentioned Christian “Glades” Miller. This nickname refers to an area in Brothersvalley Twp., Somerset County, where the family first settled. Another example is Samuel Miller, Hannes’ brother, with a son also named Christian, whose occupation was that of blacksmith, and he became known as Christian “Schmidt” Miller. We relate his inspiring story in another article. Yet another Christian was referred to as “Keim,” a reference to his wife’s family. Other generations and lines have Christian Millers with the middle initials of “B,” “G,” “J,” “M,” and others. Research is ongoing as to the references and relations here. In conclusion, the genealogy of Susan’s Swiss-German-American ancestors can be difficult because of the duplication of common names such as Christian, but no more difficult than studying my parents’ ancestors from the British Isles. See Tradition Naming Patterns in Scotland. I’m sure that all of our religious and patriotic families wished to preserve, remember, and honor biblical and royal names that identified their ancestors. In fact, the duplication of names can actually help the historian place persons accurately in their correct generations, if he knows the naming customs and they have been followed. So, here we find delight and perhaps even pride in the given name “Christian” as it reminds us of our religious heritage and allows us to connect our families over more than a dozen generations and almost 400 years. See the documentation at the end of each of the various Christian Miller family trees.